For many workers, landing a new job means crafting a great résumé that highlighted your experience, strengths and penchant for hyperbole. For tech-industry employees, though, résumés might be headed for the dustbin of history. The act of actually getting their hands dirty looking for a job might be going there, too. One company that wants to speed the evolution of job-searching is a startup called Entelo, which launched on Wednesday and has raised an undisclosed amount of funding from Battery Ventures and Menlo Ventures. 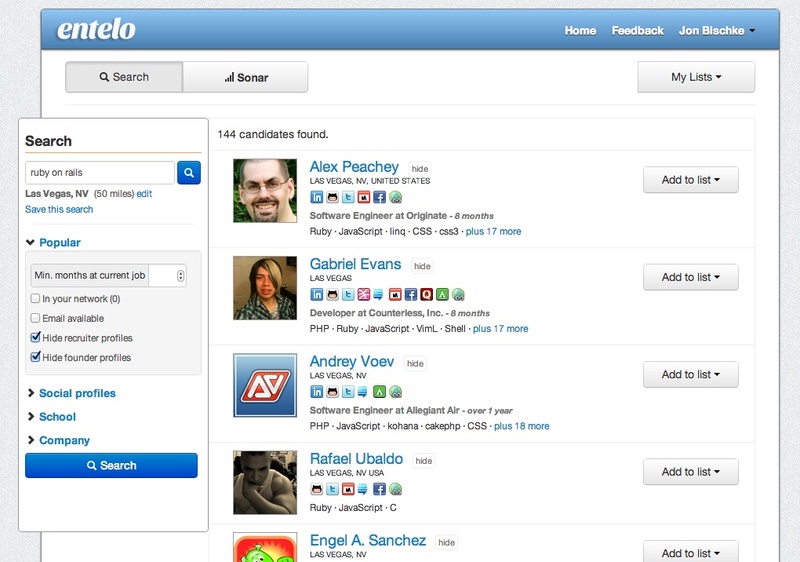 Entelo aggregates public data from a variety of online sources that might do a better job of displaying high-tech skills than a resume ever could — Github, StackOverflow, Quora and LinkedIn (s lnkd) among them — and creates profiles of potential candidates. After six months in private beta, Founder and CEO Jon Bischke told me, the company has created more than 300 million profiles and has more than 40 paying customers, including Box.net, LookOut, Kontagent and LevelUp. Recruiters can search those profiles and filter by skills, education or a number of other factors, but the real beauty of Entelo is that it predicts for clients when the best talent might actually be willing to come work for them. Bischke said Entelo has a predictive model that might indicate when someone is in the market for a new job. One factor is the length of time he has been at a job in comparison to his historical tenures, but the most telling, Bischke said, are updates to social profiles. But the company also could deliver value outside the world of talent acquisition by spotting macro trends and reporting on them. For example, Bischke said, the company’s algorithm could spot — indeed, already has spotted — upticks in profile activity among employees of individual companies that could suggest an acquisition or perhaps a round of layoffs is coming. Of course, there’s value there for recruiters, too, who have had to manually keep track of things such as the dates when stock lockouts lift following an acquisition or IPO. “We’re using big data to apply some automation to stuff good recruiters have done for many years,” Bischke said. Although, he noted, Entelo has to be careful to take any business expansion slow and to first focus on getting the core business right. Part of the challenge for Entelo will be finding a middle ground between being a straight delivery mechanism for potential employees and being something more intelligent. Bischke doesn’t think it’s fair for Entelo to pre-judge individuals’ suitability for any given position aside from traditional means of search-engine relevancy, but Entelo is gathering a lot of data (e.g., number of followers on social platforms, number of code commits, education, etc.) that could help identify trends among the people who end up getting hired. Another challenge, he said, is “trying to assess the probability a person is the kind of person you’re looking for.” While the guys who created Ruby, Github or any other popular technologies and platforms probably are very skilled and have accordingly large social followings, it’s highly unlikely someone will be able to hire them, so putting them at the top of search results — or surfacing them at all — isn’t really valuable for Entelo’s recruiter clientele. And there’s still a lot of room for growth in the talent-acquisition space proper without trying to get too fancy. “The wind is at our back” in terms adding new data sources, he said, with services such as Github for specific fields already popping up. If Entelo is ambitious, it could move beyond its technology roots and start targeting fields such as law or medicine, too. “There’s a huge amount of open sky,” he said. Feature image courtesy of Shutterstock user maminez.